Sausage Egg Casserole Topped with Cinnamon Rolls is a delicious and easy breakfast casserole recipe. Breakfast casseroles are great for holiday gatherings and with Christmas coming up I decided to try out a new recipe. 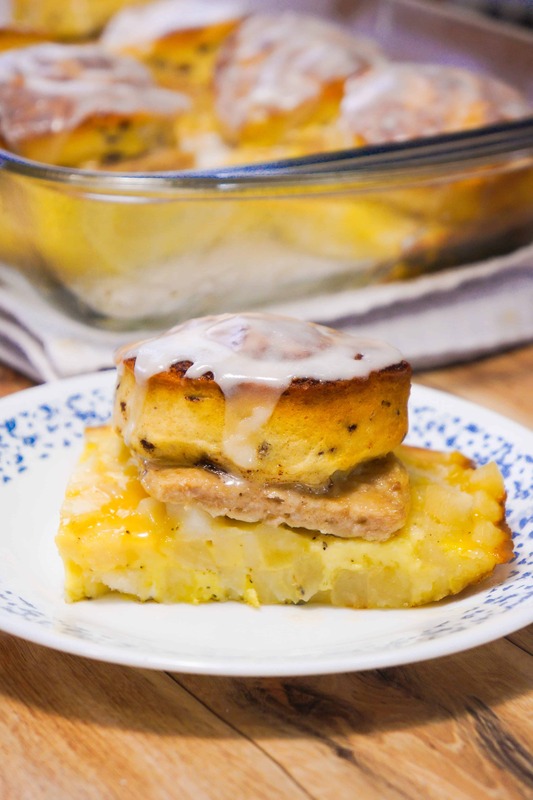 This cinnamon bun breakfast casserole would be the perfect meal to serve your guests on Christmas morning. If you make a lot of casseroles I recommend you invest in some baking dishes with lids . They are super convenient for transporting food and storing leftovers without having to fight with cling wrap. To make this breakfast casserole I started by pouring frozen diced potato hash browns into the bottom of a greased 9 x 13 inch baking dish. I spread the potatoes out evenly and then poured some beaten eggs over top. Then I placed some frozen sausage rounds over the eggs spacing them out evenly. I baked the casserole in the oven for thirty minutes and then pulled it out. I placed eight Pillsbury cinnamon rolls on top of the casserole and returned it to the oven until the buns were nicely browned. After removing the casserole from the oven again I spread the icing over the cinnamon buns. I cut the casserole into eight pieces so that each serving had a full cinnamon bun, but an adult with a good appetite would probably eat two pieces depending on what you are serving along with it. This breakfast casserole is the perfect balance of savory and sweet. 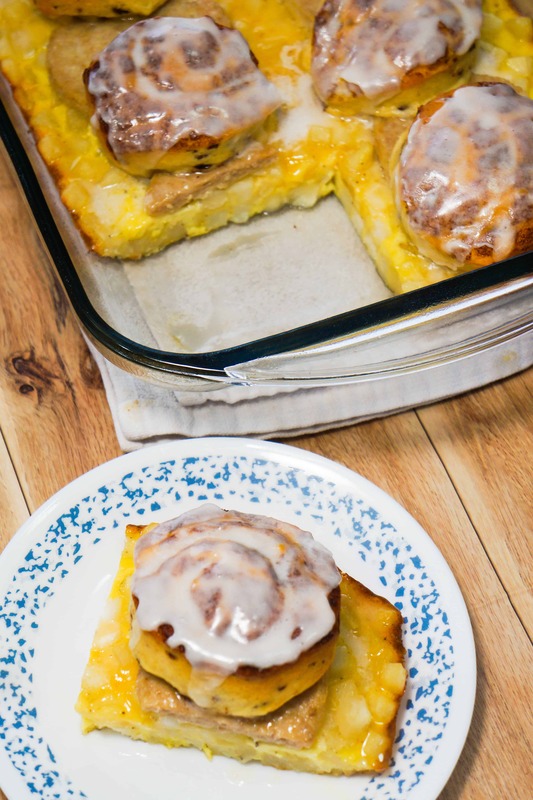 Try this Sausage Egg Breakfast Casserole Topped with Cinnamon Rolls if you are looking for an easy but impressive breakfast dish. 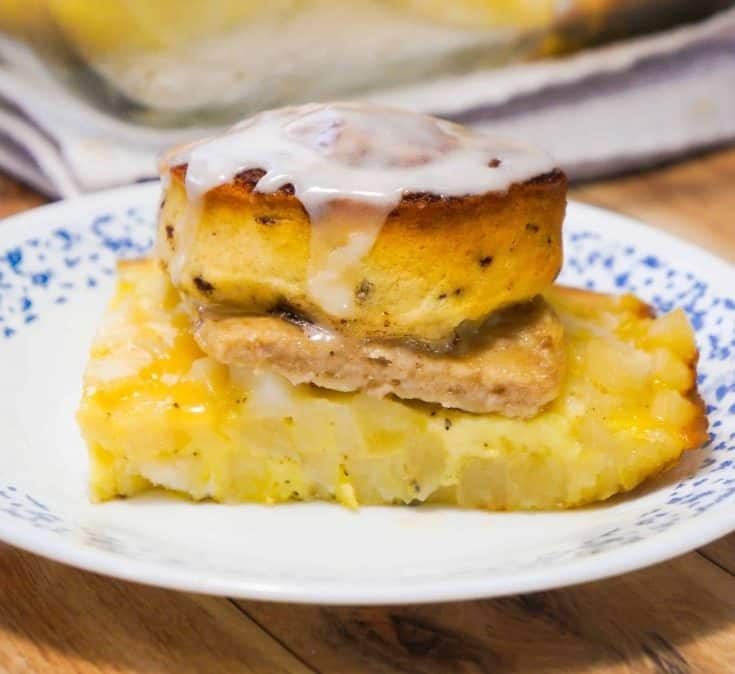 If you are looking for more easy breakfast ideas check out Maple Pancake Breakfast Casserole, Peanut Butter and Brown Sugar French Toast, and Muffin Tin Fruit Loop French Toast. 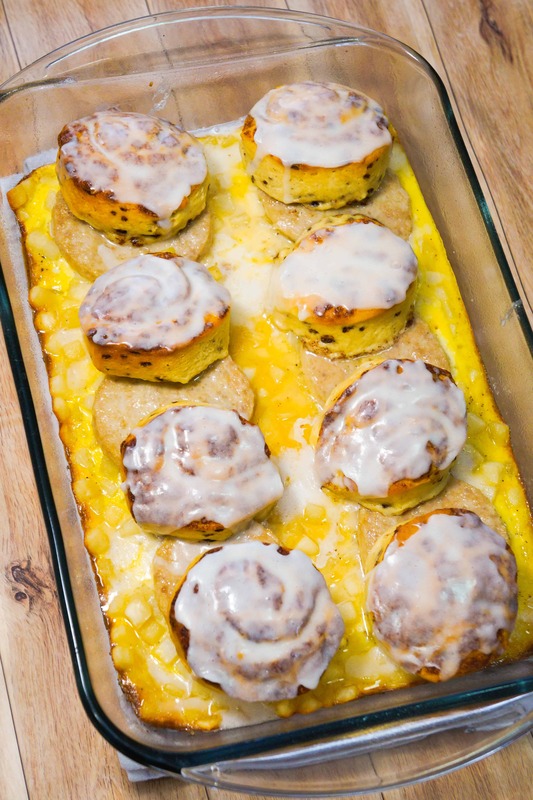 Sausage Egg Breakfast Casserole Topped with Cinnamon Rolls is an easy breakfast recipe perfect for the Christmas holidays. This easy breakfast casserole is loaded with hash browns, egg, sausage and topped with Pillsbury Cinnamon Rolls. This is the perfect brunch recipe. Pour the frozen hash browns into a greased 9 x 13 inch baking dish and spread them out evenly. In a small mixing bowl whisk together the eggs, milk, salt and pepper. Place the sausage rounds over the eggs and hash browns, spacing them out evenly. Put the casserole in the oven and bake for 30 minutes. Remove the dish from the oven and place the 8 cinnamon rolls on top spaced out evenly. Return the casserole to the oven and continue cooking for 18-20 minutes until the cinnamon rolls are nicely browned. 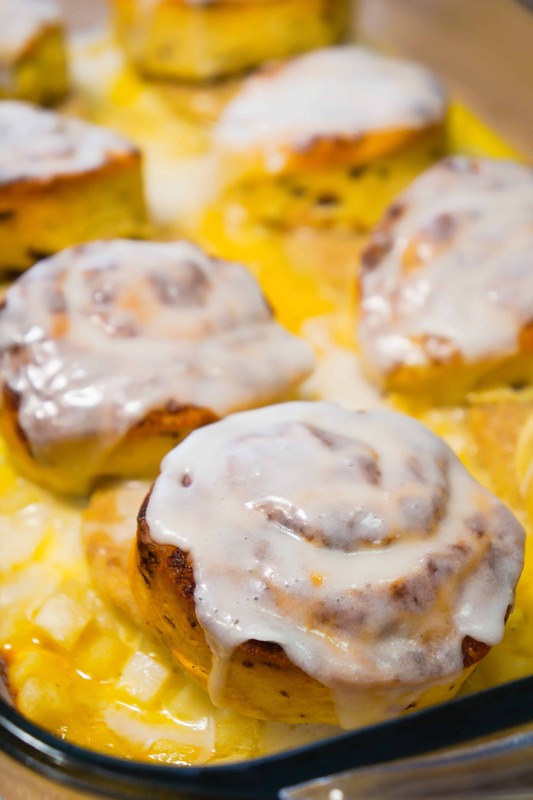 Remove the casserole from the oven and spread the Pillsbury icing over the cinnamon rolls.